With the latest round of snowfall still covering the ground here in Central PA I figured I would try to make the best of the situation by putting together a list of my favorite uses for the white stuff in and around the veggie garden. Scenic Landscapes – I’ll admit that the white stuff does make for beautiful photos and offers plenty of opportunities to come up with an interesting shot or two. The landscape always seems to take on a dream-like character immediately after a significant snowfall. Drip Irrigation – I’ve written previously about how to use snow to irrigate container fruit trees that are moved into the garage during the winter. The snow will melt slowly when the temps in the garage are more suitable for the water to be put to good use in the containers. Tracking Wildlife – If you thought there was no activity out in the garden during the winter a fresh snowfall will change your mind quickly. Not only can you discover what animals frequent the landscape, but you can also clearly see the network of their favorite paths and trails that have been established. Renewing Groundwater – We all know that winter is a critical time for replenishing the water tables that will be drawn upon during summer droughts, and there is nothing like a slow, gradual thaw and snow melt to sink deep down into the garden’s soil layers. Charting Micro-climates – There’s a lot to learn from watching snow melt and noting where it melts unevenly. Areas in the landscape where snow disappears quickly are signs of a warmer micro-climate; while the snow will linger and remain on the ground days or weeks longer in the cold pockets. You can use that awareness to place specific plants in areas where they can take advantage of the slight differences in temperatures or exposure. 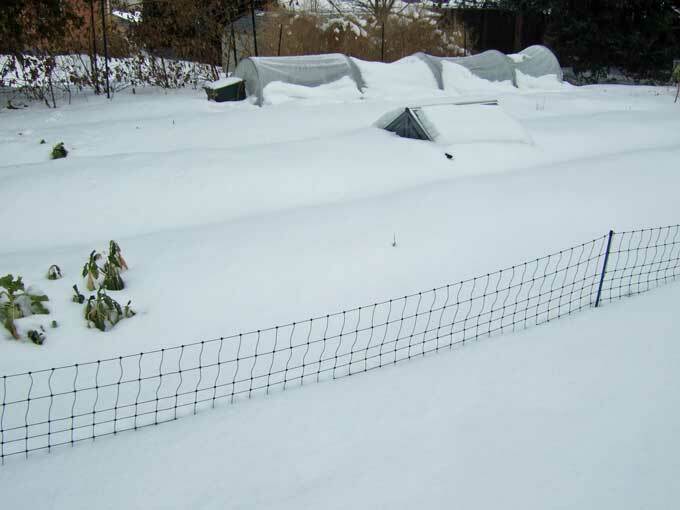 Insulation for Plants – A deep snow can also serve as a mulch for the garden and is great for insulating the soil and to protect over wintering plants from the cold and harsh winds. If you have a reliable snow cover in your growing region you may be able to get away with not mulching crops like that fall planted garlic. Stress Releases – As in a good old fashioned snowball fight, building that classic snowman, a few snow angels, or the way that Jaz, my dog does it by running around like he just escaped from an animal shelter. Nothing gets him worked up quite like the chance to go out and play in the snow. I guess I’ll try to focus on the more positive aspects of the frosty flakes as we endure a few more weeks of winter weather. And if we’re going to have cold temps then there may as well be snow to go along with it. Let me know if you have any better ideas to help enjoy the next snowfall as we wait for springtime to arrive! So nice to find someone else who is embracing Winter. Carolyn, I’m embracing winter alright… but praying for an early spring! That’s so true about the animal tracks and charting microclimates. I use it for that commonly. Thanks for the info!–I’m glad my garlic has a great insulation! Hi Ottawa, yes the snow has many lessons of its own and makes it easy to see with a quick glance some things that we would normally overlook… but I don’t mind you benefiting more from that than we do here in PA! Previous post: Are Seed Catalogs Growing Obsolete?